Ideal solution for automation, integration and robotics. The optoNCDT 1320 is a new class of laser triangulation sensors for displacement, distance and position measurement. 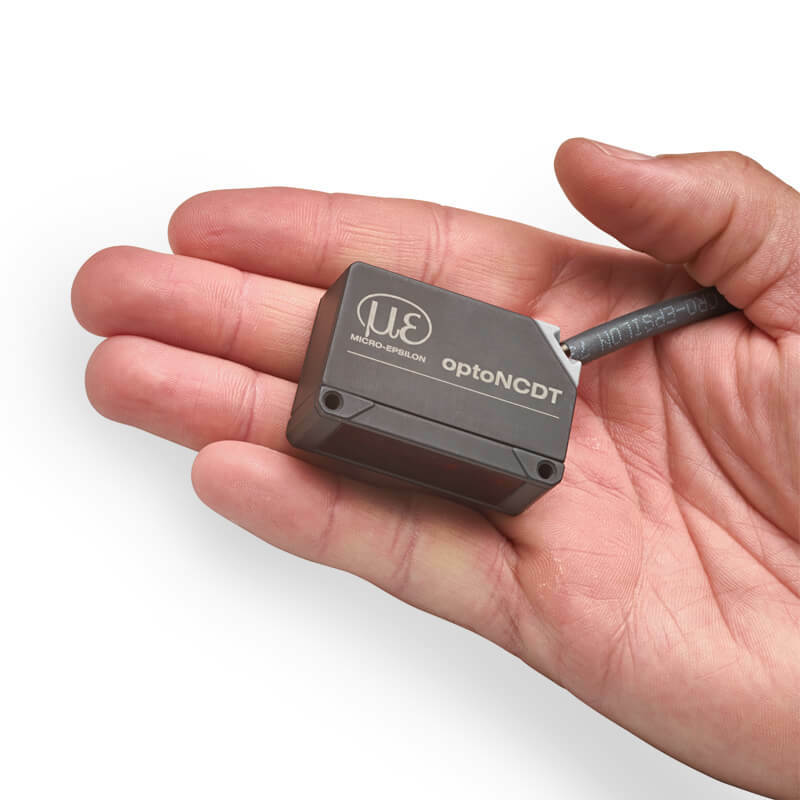 Although Micro-Epsilon classes the optoNCDT 1320 as an entry-level laser displacement sensor in our product portfolio, the technical features exceed many mid-range performance sensors currently on the market. Despite its extremely compact size, the laser triangulation sensor offers excellent measurement performance. With an Integrated controller, selectable analogue or serial output and Auto Target Compensation (ATC), the sensor can solve many precision measurement tasks. The sensor also benefits from a competitive pricing structure, making it suitable for both single piece and higher volume OEM applications. Due to its compact size and low mass, the optoNCDT 1320 is ideally suitable for applications with restricted space or where high accelerations occur e.g. mounted on robot arms or in pick-and-place machines. The Auto Target Compensation (ATC) provides stable measurements regardless of target colour or brightness. Precision optics normally found in more expensive sensor series create sharp and small diameter spot geometries, enabling very small objects to be reliably measured. The optoNCDT 1320 models enable quick sensor commissioning with just a few clicks using the multifunction 'sensor' button. For users of multiple sensors with the same configuration, a simple and intuitive web interface can be used to setup and download the sensor parameters. The interface even has pre-set sensor configurations for the most common surface types, enabling faster setup and optimum sensor performance. The combination of speed, size, performance and application variety defines a new class of laser sensor. The worldwide unique SMART sensor concept combines an integrated web interface with a compact sensor size. Available in measuring ranges of 10mm, 25mm or 50mm, the excellent price/performance ratio of the optoNCDT 1320 series enables new areas of use, especially for high volume applications in machine integration and factory automation.